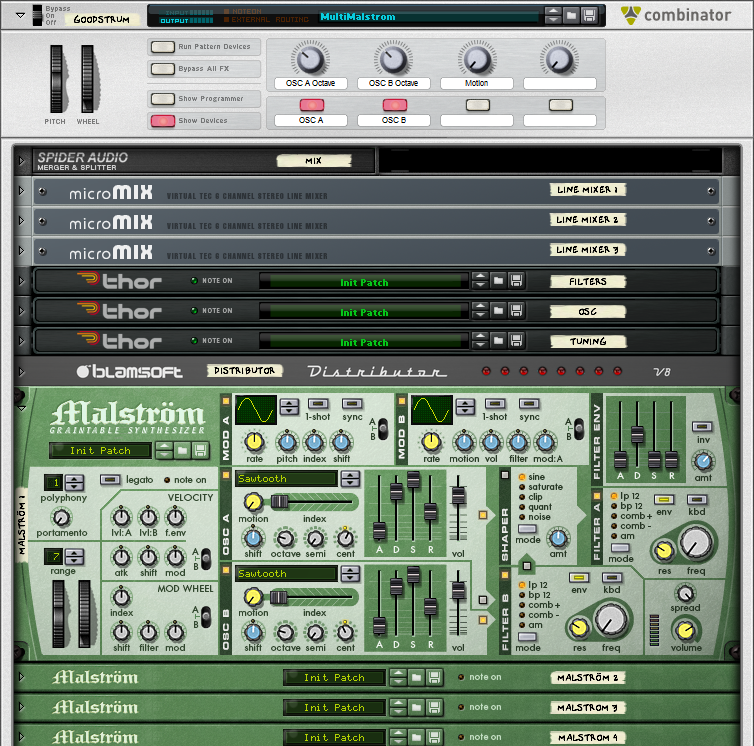 Malstrom is a powerful synthesizer. Using Distributor to connect 8 Malstroms into a multi-voice instrument adds character and variation to the synth to make it even more powerful. 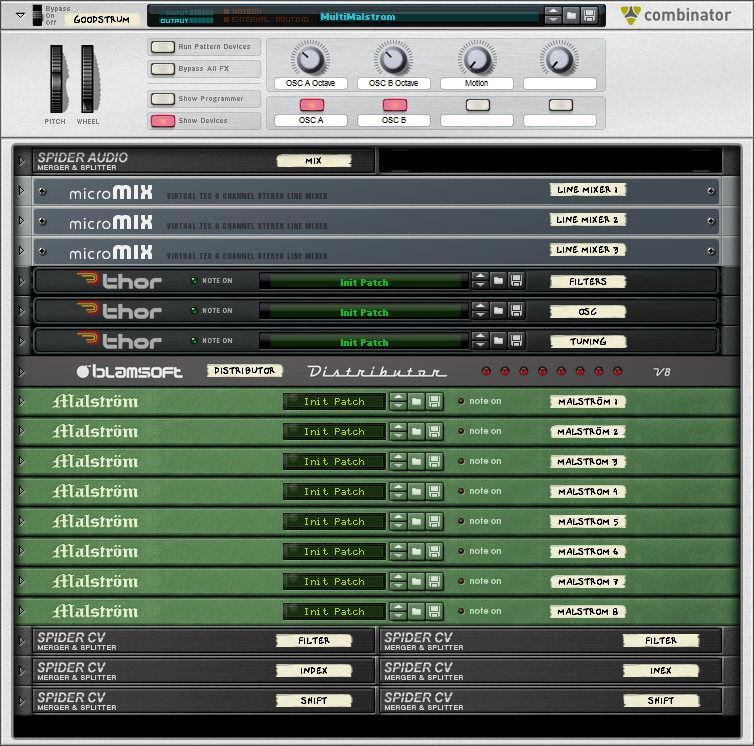 The MultiMalstrom Combinator is an example of a way to maximize the Combinator mapping space and CV device control for a large multi-voice synthesizer based on Distributor. The details of the Combinator and some tricks for using it are given in this tutorial. First of all, why bother with multiple voices? The answer for many is to achieve the fatness and character of an analog or acoustic instrument. And for others it could be exploring interesting new combinations of sounds. The Combinator is set up by default to give an very analog sound, so have a listen. If you’re on board with multiple voices we can proceed to the explanation. The Combinator consists of three line mixers to mix the voices, three Thors, used for their modifier knobs, a Distributor to process MIDI, 8 Malstroms for sound generation, and a few Spider CVs for routing help. The Combinator controls give universal control over a few Malstrom settings. The oscillator octave and enable settings are available. Also, the Motion knob can control the oscillator motion. Note that the motion is slightly different for the two oscillators, which is set in the range settings of the Combinator programmer. 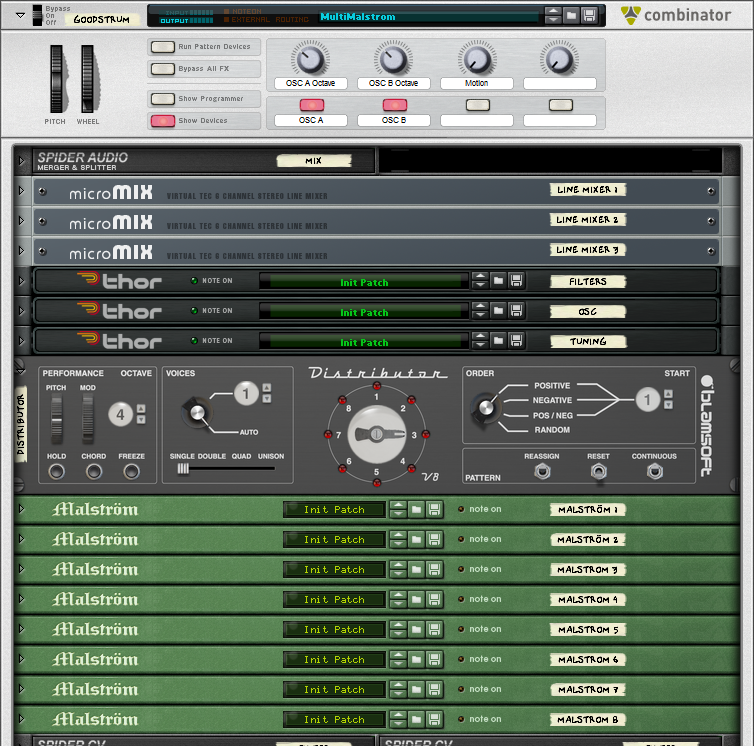 The mixer handles each oscillator independently. There are a pair of channels for each Malstrom. Each oscillator can be panned uniquely. There are three Thors used as controllers. 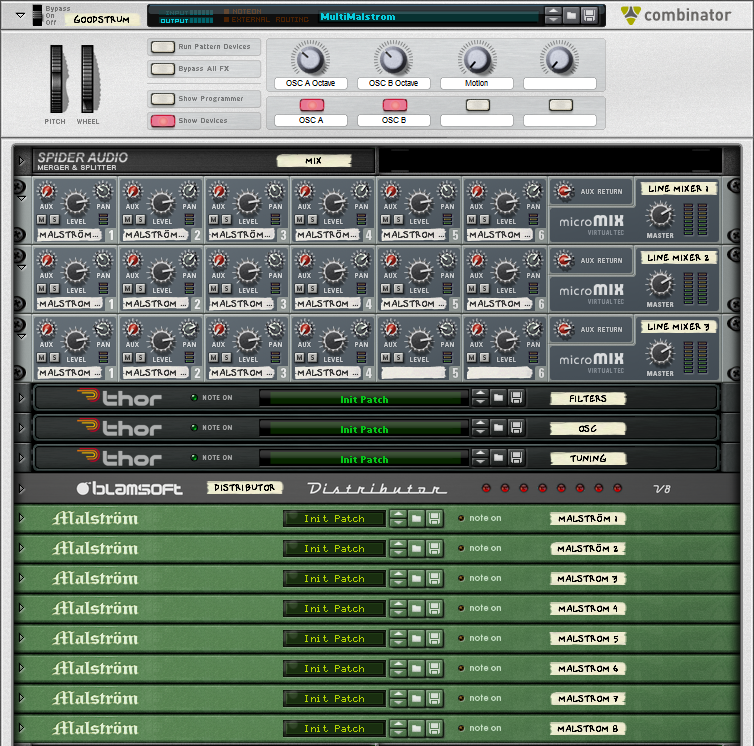 The first Thor controls the filter frequency and resonance for all of the filters. The second Thor controls the oscillator index and shift settings. These controls are universal but the settings can also be altered on each Malstrom. In the default setup these settings are slightly off from zero to create subtle variation. An LFO can be used to modulate the index of all of the Malstroms, enabled with button 1 of the Thor. The third Thor controls tuning. There is a Detune knob and a Drift knob. Detune tunes the oscillators away from each other. Note that the Combinator mapping to Oscillator Cents is slightly different for each Malstrom. The Drift control applies a slow smooth random LFO to oscillator frequency to emulate analog oscillators. 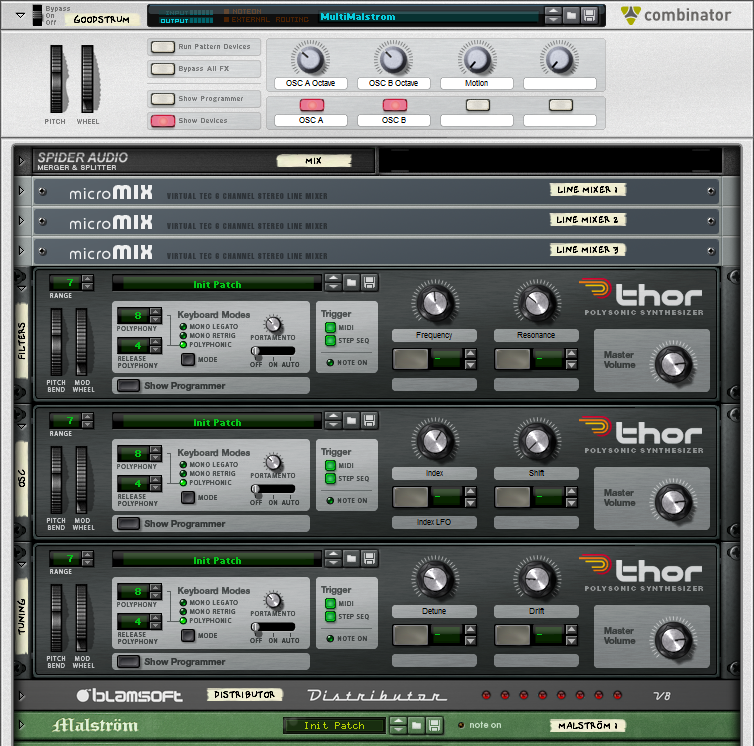 Note that LFO 1 is used so the Thor needs to receive notes. The Distributor handles all of the MIDI data for the Combinator and controls the Malstroms with CV. This includes note, gate, pitch wheel, and mod wheel. To learn more about operating the distributor see the overview video and user manual. Each voice is a Malstrom synthesizer. Note that the index has been set close to zero because it is controlled by CV. Shift is also controlled by CV and has been set near the default. The waveforms and envelopes need to be set on each Malstrom voice. Now that you know what’s in the Combinator, you can tweak it to create new sounds. You can also add a Matrix sequencer to experiment with varying patterns. Leave any mapping suggestions or other comments in the section below.